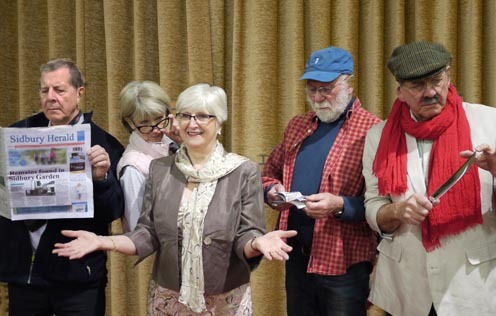 Sidbury Into Drama (SIDS) is a group of enthusiastic amateurs who enjoy presenting two productions a year in Sidbury Village Hall. If you are interested in performing, sound and lighting, props, costumes or just helping backstage we would like you to join us! Contact Joy Loveridge (01395 516504) for more details. The date for the next AGM will be Tuesday 23rd April 2019 in the Skittle Alley at the Red Lion to start at 7.30pm. Please do try to come along, we really do need to have your views and support for our drama club. Tickets are now available from Drews. The cost is £12.50 and will include a 3 course supper and wine will be available from the bar. Click here to view photographs of the pantomime - "Sid And The Lost Treasure". SIDS Double Bill dvd 2 disc set! Only £4.00 - a real bargain! Click on "Shop" from the menu or contact David on 597486. Have you any comments or suggestions about SIDS? The productions? This website? Click on Have Your Say in the menu to read what others have said or to add your own comments. Please feel free to "have your say", but be aware that contributions will be reviewed on upload to the website and offensive or obscene content will be removed. Also please bear with the necessity to include a verification code to prevent automated entries.